Announcing this year’s Dolphins Cancer Challenge (DCC) and your opportunity to support Team Hurricanes. Here’s what you need to know about this year’s DCC. This year, the University is significantly expanding its support of DCC, and with your partnership, we will have the largest team in the University’s history on Saturday, April 6. Click the buttons below to select your team based on your campus affiliation and use promo code teamhurricanes100 for free registration. As a Team Hurricanes participant you will be receiving two packets, a Team Hurricanes packet, and a DCC packet. Learn more about what you need to know if you’re planning to go to DCC IX. For more information, please email ridedcc@dolphins.com. In past years, the University has supported both the DCC and the Mercedes-Benz Corporate Run. This year, we will focus our efforts exclusively on the DCC, which provides critical philanthropic support to the University’s Sylvester Comprehensive Cancer Center. 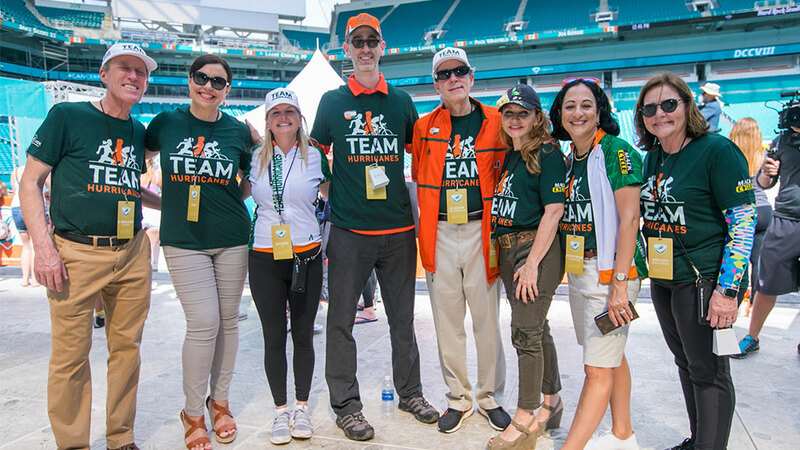 The DCC is a family-friendly team event with the option to run, walk, cycle, or even ride virtually, so there’s something for all members of the ’Canes family. Learn more at www.dolphinscancerchallenge.com, and use promo code teamhurricanes100 for free registration. For any questions regarding registration or employee incentives, please contact DCC@miami.edu.